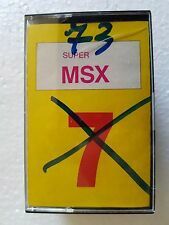 can someone tell me where i can find working examples of msx-c 1.2 programs? i am using the glib.h graphic library and all that o know is drawing pixels and squares and rectangles. I saw the manuals out there showing the syntaxes but i couldn't write any program only knowing the syntaxe. I miss some examples to test and see how they work. Hi, take a look at this documentation I think is good for MSX-C.
You can look there all the libs functions. I think that for graphics one you have to initialize them before, with ginit(). For sprites, seems that you need to call inispr(size) before using them. Also remember that hardware sprites are not like bitmap sprites, they have special rules and format, for color and graphics. Seems that you can define them with sprite() like in BASIC. Then, draw sprites with the putspr() function. See that it only gets one color data, for single color sprites, this is sprites mode 1 (the MSX1 mode). For sprite mode 2, or multi-color sprites, first you need to call colspr() to set the color data for that plane (plane = sprite number from 0 to 31) and then putspr(). But without a complete example i just dont know how to draw sprite, how to organize a complete program to show them. now is time to understand how this example works and create my own sprites. 8 lines colored and 8 lines black. How to correct this?